Kangaderoo Custom QR Code. : Beware of QR Codes. Quote from the movie Shoot 'Em Up: "Guns don't kill people." There was a new discussion on Linkedin concerning the dangers of QR Codes. One of the comments was related to this story that mentions a QR Code wiping an android phone. Sure it's a scary notion that scanning a QR Code can wipe you phone, but is it a QR Code danger? The bug itself is part of the android OS, the article is over a year old; updates have closed the gap. In an operating system that is popular some people will always look if there are weak spots that can be exploited. Windows as the most popular desktop OS is the main target for virus and mall ware. Just surfing on the internet can be enough to infect the system. With Android being the most popular mobile OS it should not be a surprise that any weak spots will be exploited. 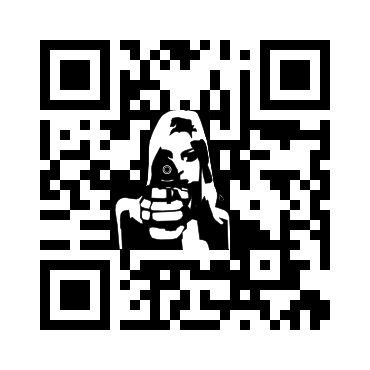 The QR Code being the best know and most used 2D bar-code is therefore being misused by people who mean to do harm. My opinion with regards to QR Code is that the benefits outweigh the dangers. The qr code scanner apps available are constantly updated giving you the content of the scanned code first; and give you the choice to act in stead of automatically open an link, dial a phone number, or send a text message. The trend that the internet will be more and more used by smart phone with regards to desktop computer just cries out for a technology that can link the real world to the internet, preferably by using the mobile phone sensors.